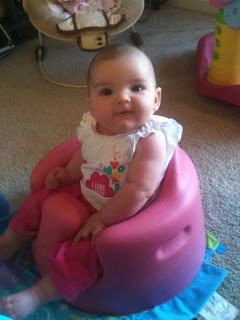 CeCe's Bumbo baby-seat let's her sit upright so she can feel like she is part of the party. She has a great view of her new favorite toys (her feet) and exercises that awesome head control. You'll have to wait until your little one has good head and neck control to use it, but I definitely wish I had known about the Bumbo when I was going trigger-happy with my registry scanner gun. I looked online and in-store and the seats all seemed to be the same price, about $40. I think we will get out money's worth on this one. It's taken me a while to quit calling it a "Bumpo" seat, and a fellow mom told me her dad referred to it as the "Bimbo." Whatever you want to call it, I love it. Hi! I found you through the Mom Blogs. 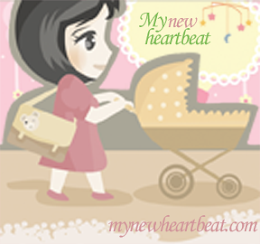 What an awesome blog you have, and your daughter is so adorable! !